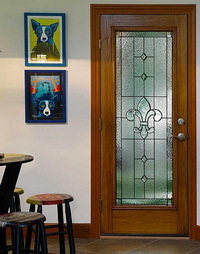 Taking its name from an historic New Orleans neighborhood, Carrollton door glass offers a bit of Classic and formal design for your home. 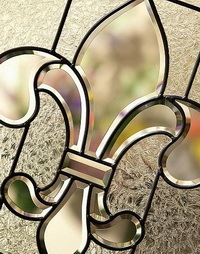 A fleur-de-lis bevel cluster is the glass's focal point, with soft additions of translucent and clear glass and a patina finish. This Classic design has a high privacy level.